My paternal uncle Shri K. Subramaniam's son, Chi. 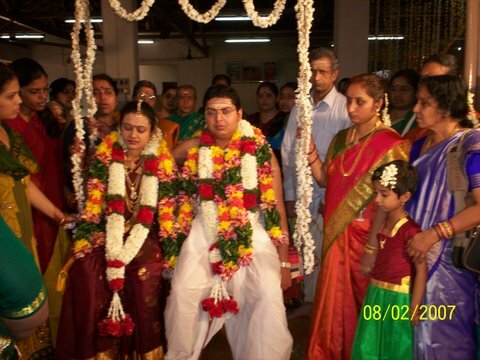 S. Narayanan was wedded to Sow. Prathiba on Thursday, 8th February, 2007 at Tali Brahmana Sabha Kalyana Mandapam, Kozhikode, Kerala, India. Narayanan, also known as Kuttan in family circles, is the youngest son of Shri Subramaniam and Smt. Meenakshi. He is an IT Professional specialised in Linux OS and is working as the Chief Architect of a software company in Kochi. Prathiba is the daughter of Mrs. & Mr. S. Ranganathan, pursuing her ACS with the Institute of Company Secretaries of India. Both of them now reside in Ernakulam, India.